Pair of Solid Brass. Includes Pair of hinges & screws. MADE IN PENNSYLVANIA. 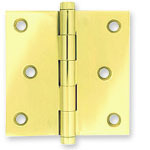 Hinges are offered in Polished Brass, Polished Chrome, Polished Nickle, Satin Brown, and Satin Black finishes.